Two 4-ounce medallions of tender filet topped with three large shrimp. A smaller, 12-ounce Ribeye that's equally juicy and well-marbled for peak flavor. 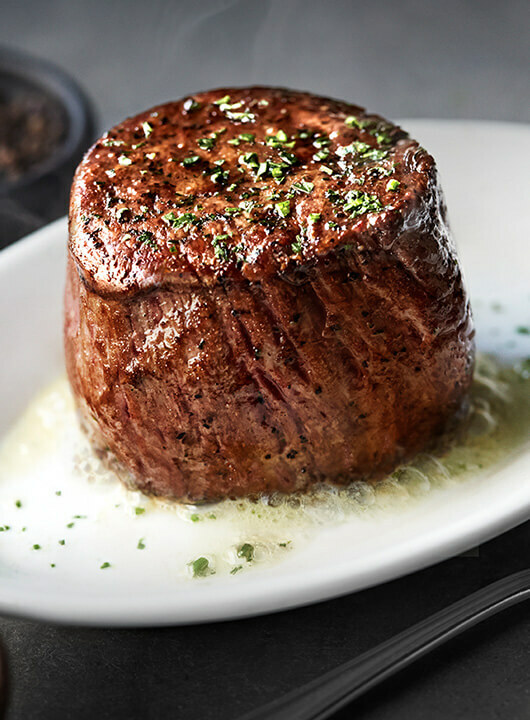 19 ounces of sheer perfection—full-bodied and full of flavor. Ruth's favorite cut. Cold water lobster tail, lightly seasoned with Cajun spices, sea salt and butter. Jumbo lump crab cake, asparagus and homemade béarnaise sauce. Sautéed New Orleans style in reduced white wine, butter, garlic and spices and served on a bed of roasted garlic mashed potatoes. Three jumbo lump crab cakes served with sizzling lemon butter. Succulent large shrimp, lightly fried, tossed in a spicy cream sauce, served with a tangy cucumber salad. Two jumbo lump crab cakes served with sizzling lemon butter. Jumbo shrimp dressed with our spicy New Orleans homestyle cocktail sauce. There's no better way to end a meal at Ruth's Chris than with a delectable dessert. With handcrafted, house-prepared selections that range from Louisiana-French classics to indulgent new creations, you're sure to end on a sweet note. A beloved classic topped with choice of four spirited crème Anglaise sauces: Orange Cognac, nutty Frangelico®, raspberry Chambord® or coffee Tia Maria®. Chocolate cake coupled with chocolate mousse splashed with a little sweet cream and topped with fresh berries. The classic Creole egg custard topped with fresh berries and mint. Ruth perfected the recipe herself—now it's considered one of the best in the world. Enjoy a light end to your meal with a celebration of natural flavors, done simply. Super premium ice creams and sorbets. Ask your server for available flavors.